A major political slugfest broke out in Tamil Nadu on Tuesday over the arrest of a woman student who raised slogans against Bharatiya Janata Party on board a domestic flight with the Dravida Munnetra Kazhagam and other opposition parties condemning it even as a Tuticorin court granted her bail. As the BJP and its state unit chief Tamilisai Soundararajan, on whose complaint the woman was arrested, came under fire for 'crushing' freedom of expression, the ruling All India Anna Dravida Munnetra Kazhagam defended the police action, saying if such conduct was allowed, political leaders could face a security issue. A night after her arrest, 28-year-old Louis Sophia, a student of a Canadian university on a visit to her native Tuticorin, was granted unconditional bail by a court in the district headquarter town. 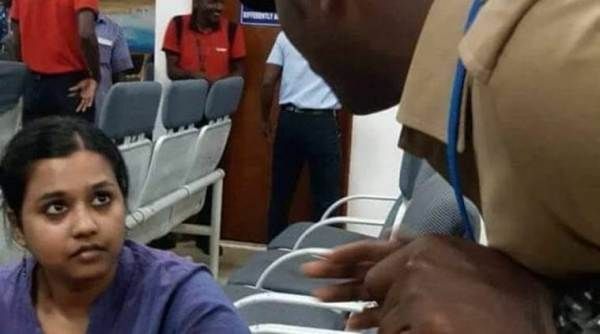 Soundararajan and the student, who travelled to Tuticorin by the same flight on Monday night from Chennai, were involved in an altercation after landing at the airport, a video of which was aired by TV channels. Tamilisai is heard telling the student and the other people at the arrival lounge that a plane was no place to raise slogans. "It (inside of a flight) is not a public forum....how can you expect me to keep mum when she shouts 'down with BJP's fascist government' looking at me? Is it freedom of expression?" she asked. The arrest triggered outrage, with DMK president M K Stalin slamming the BJP state chief and questioning her tolerance to criticism. 'The central BJP government is crushing freedom of expression and the state government is aiding it. This is regrettable,' he said in a statement. Condemning Sofia's 'hasty arrest', he recalled the Supreme Court's observation on the recent arrest of Left-wing activists that dissent was a 'safety valve' in a democracy. "In a democratic country, a citizen can criticise not just the BJP government but that of any party and the state BJP chief's action amounts to infringing on that freedom," he said. Makkal Needhi Maiam founder-president and actor Kamal Haasan, Amma Makkal Munnetra Kazhagham's T T V Dinakaran and Communist Party of India-Marxist Politburo member G Ramakrishnan also denounced her arrest. However, defending the arrest, senior AIADMK leader and state Fisheries Minister D Jayakumar accused the woman of seeking publicity and said she could have opted for more democratic avenues to express her views. "One can express their opinions or stage a protest in democratically approved places, can speak from a platform. Such avenues should be used to exercise freedom of expression. But some do such things for publicity for self-promotion," he told reporters in Chennai. He said an aircraft or airport was a public place under the jurisdiction of the Centre. "No democrat would accept someone raising slogans there or behaving in a way not in keeping with democracy," the minister said. "If this practice is allowed, no leader can go to a railway station or airport. One group will shout slogans against Stalin inside the airport. This will end up becoming a security issue for political leaders," he said. Dinakaran claimed the student raising slogans against 'fascist BJP' was reflective of the mood of youth. He said the BJP needed a course-correction. He also took a swipe at the AIADMK government, criticising it for the 'haste' in detaining the student. Actor-politician Haasan said all politicians were liable to be arrested if raising slogans and criticising in public was a crime. Unfazed by the criticism, Soundararajan defended her action and alleged that Sophia's remarks and gestures indicated that some organisation could be behind her. Speaking to reporters in Chennai, she asked if other political leaders were okay with someone raising such slogans against them, especially on a flight. Taking a dig at the DMK, she said its cadre had once attacked the BJP office in Chennai over a Vishwa Hindu Parishad leader's remarks against former chief minister the late M Karunanidhi at the height of the controversy over the Sethusamudram navigation channel project in 2007. "Will you tolerate if someone raises slogans against you on a flight. Will the same leaders remain quiet if they are faced a with a similar situation?" she asked. There are 'appropriate' forums to exercise freedom of expression, she said and demanded that Sofia's background be checked. Police said a case had been registered against Sofia under Sections 505(1)(b) (intent to cause fear or alarm) and 290 (public nuisance) of the Indian Penal Code and section 75(1)(c) of the Tamil Nadu City Police Act. "We will question the passengers and crew as well since the incident happened on board the flight," a police official said. While being taken to the prison last night, the woman complained of uneasiness and was admitted to a hospital. After third Judicial Magistrate S Tamilselvi allowed her bail application, the woman was discharged from the hospital today evening and sent home, police said. Meanwhile, Sophia's father has lodged a counter- complaint against Soundararajan and her supporters, accusing them of holding out threats.